I have a Warre hive which is doing well and the bees are quite robust. I recently put a third box under as it's a pretty good spring here with lots of nectar around. However, when I do look at a frame from the top box to see how they are faring, they have built comb all the way down to the topbars of the box below. This means I break the comb when I take it out. This probably doesn't hurt them too much, but they then have to clean it up and I hate doing it because it causes unnecessary damage. Last summer I took a full box of honey from that hive and every comb was attached to the top bars below and so was broken in the process. I have made some frames that are full rectangles to overcome this, but it doesn't seem to be in the spirit of the Warre hive. Does anyone else have this problem? If so, any solutions for minimising damage when extracting frames? Two options to reduce this problem. One is to open up a little more often to keep the space clear. Second way is to use a cheeswire which as the top of the top bars should be level with the box join should separate the boxes avoiding this problem. I go for the latter option. A good way to prevent this, is give only one box at a time. You let them built right down to the floor. The tips are pointy first, but are drawn more and more until the combs' tips are flat. Once you reach this stage, you can nadir another box and the bees will less likely attach the flat comb to the topbars below. Some more frequent insepctions and some cleaning and you get nice combs and moveable boxes. Thank you very much for these helpful suggestions. Too early to nadir if the combs are not finished. While in "real beekeeping" the advise is to super in advance, you wait until the bees finished the comb and filled it with lots and lots of brood when nadiring. 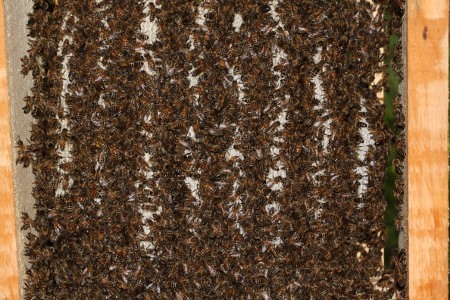 Once the combs are flat as shown in the first picture, the bees do not add much brace comb between boxes. 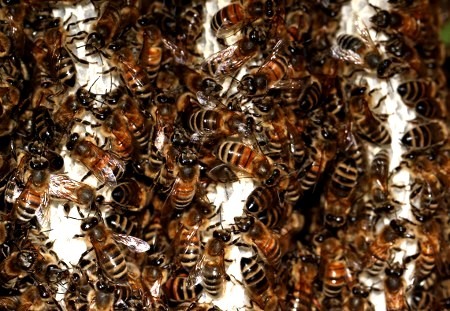 Nice fotos Bernhard, if you nadir late does that increase the risk of swarming? 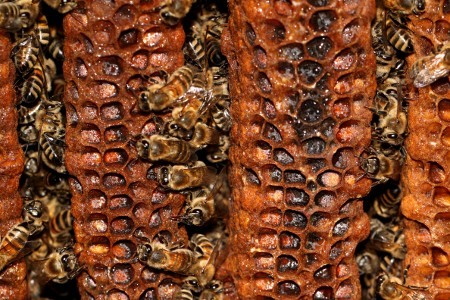 How do you reduce this in your Warre hives? I once faced this problem and I did what catchercradle said and it worked well.